Salaams my lovelies! I hope you have all had a wonderful week inshallah. Typically, I do a fun Follow Friday post, but today, I wanted to share something personal with you. I recently stopped blogging for a bit because of something I have had to grapple with. I have noticed a scary new trend that I would like to call “mean girls with hijab.” Just so you know, I am a hijabi and I always try to love and support all of my fellow hijabis, but with the advent of texting, email, and social media, it seems that some of these fellow hijabis are not quite into sisterhood like I am. Mabruk on going to Hajj this year! I wanted to let you know I never had any ill will or hard feelings toward you, but can you tell me why you had defriended me on Facebook? At the time it had hurt my feelings as I didn’t know you very well. But if you feel bad because of things someone else told you, I wish you would let me know. Good luck on the most blessed of journeys! I make my friends based on people which I find would be a good company for me and would be a good surrounding for my kids. The first time I met u u came across to me as some one who was very materialistic who wanted people to know that she had a (I have deleted the brand name here) diamond ring. There was no conversation about any type of jewelry between you and I and then all of a sudden you were (i feel) bragging about ur ring which turned me off soooooo much. I like to make friends with people who show no care about the wordly things and i’m sorry if I came across to u as someone who cared about this. I personally was really surprised by this email and just wished her a wonderful trip to Allah’s house, but I did not call her. However, I was left feeling worse off than before I emailed her. I was sent this email earlier in the week, and I wondered all week if I should share it because I did not want to share something so personal. However, I felt if I was getting emails like this, than all of my readers must have encountered something like this. A situation where a fellow hijabi is hiding behind technology to write something mean to you. A situation where a fellow hijabi would never personally utter the words to another hijabi in person, but can be mean via text, email or social media. The reason I ultimately decided to show you this email is two fold. To show you that first we must be introspective. The instance she mentioned? Maybe I was showing and I need to be mindful of first impressions. Perhaps I need to work on myself. While this email wasn’t worded the best way, it did highlight something that I need to work on with myself. The other reason I shared this email is that I wanted to actually take these hateful words out of the “hidden” world of technology. Now that these words are on my blog, do these words still seem appropriate? Let’s all be mindful of the sunnah and think before we type or speak. I know I definitely will. Salaams my lovelies! I apologize for not blogging as often, but between my regular day job, consulting, and handling a toddler, I am BEAT. I really do love blogging and want to keep this blog as a nice gathering place for you all. So I only try to make blog posts I feel are beneficial versus making my blog a place to rant and rave ha. It is Friday, which means it is time for a sneak peek into the lives of some of our hijabi social media darlings. Today, I wanted to write about Nura Afia, aka Nuralailalov. 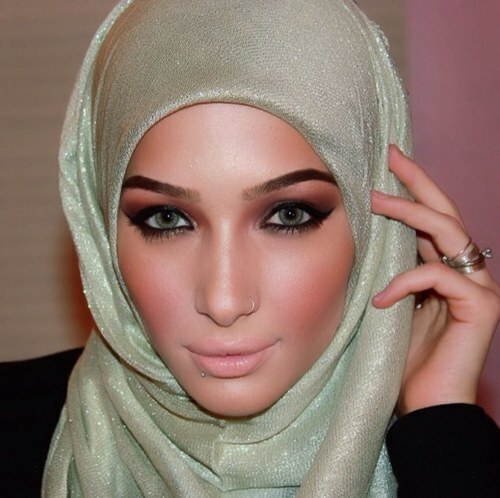 Nura Afia is a hijabi makeup vlogger on YouTube. Nura is a testament to the fact that you can be a glamorous hijabi mom. While I may not be able to live up to that, it is nice to see another hijabi be able to juggle motherhood, working, and look amazing doing it mashallah! Her videos are not only makeup tutorials, they also are reviews on the hottest makeup products, hijab tutorials, and just fun snapshots into her life as a friend, mom, and wife. I personally love her makeup tutorials as inspiration for ideas like how to contour and do dramatic looks for special events. Make sure to follow her on Instagram @Nuralailalov for short video tutorials as well. Be on the lookout for a recipe post coming your way inshallah! Have a wonderful day and jumah mubarak!